The icy moons in the outer solar system hold the potential for life, given that they may contain oceans of water. But life also needs a source of energy input to perform essential functions such as growth, reproduction and movement. How, then, could energy be generated on a distant moon, far from the Sun's warmth? A recent paper looked at how tidal heating could take place in the oceans of Saturn's moons Titan and Enceladus, which are well-studied by NASA's and the European Space Agency's Cassini mission. While scientists have some idea how thick these oceans are, the amount of energy produced from tidal dissipation on these distant worlds is unknown. Further modeling and study will be required in the coming decades. The new paper, "Numerically modelling tidal dissipation with bottom drag in the oceans of Titan and Enceladus," was recently published online in the journal Icarus. The research looked at two different types of drag models that would affect tidal dissipation within the oceans, and makes predictions about how this dissipation may change the orbits of the moons. The research was led by Hamish Hay, a doctoral candidate in planetary science at the University of Arizona's Lunar and Planetary Laboratory, and was co-authored by his supervisor, Isamu Matsuyama. Hay's research applied a computer simulation that he has developed to investigate tidal drag in the oceans of Titan and Enceladus. They included Rayleigh drag (which applies to smooth flows) and bottom drag (which is more turbulent). Actual flow in the oceans of icy moons is expected to be turbulent. Hay kept his model simple to see if it matched up with the theoretical calculations from other authors. This meant that, for example, he didn't put an icy cap on the oceans, which is what is found on these distant moons. He also kept the thickness of the oceans uniform over the entire moon. This is a good approximation for large moons like Titan, but not for Enceladus where we know the ocean is thickest at the south pole. With his model now known to match the existing theory pretty closely, he plans future papers to explore the additional effects of an ice cap and spatial changes in ocean thickness. Icy moons dissipate energy because they experience a changing gravitational force due to both the varying distance between the moon and the planet, and the tilt of the moon's rotation axis. Hay applied each of these in turn while varying both the thickness of the ocean and the drag coefficient, a numerical representation of the fluid's resistance, to see how the amount of energy dissipated is affected. He began by applying the changing moon-planet distance to Titan with the result that his model showed several spikes in energy dissipation when the ocean is quite thin, just a few tens of meters thick. 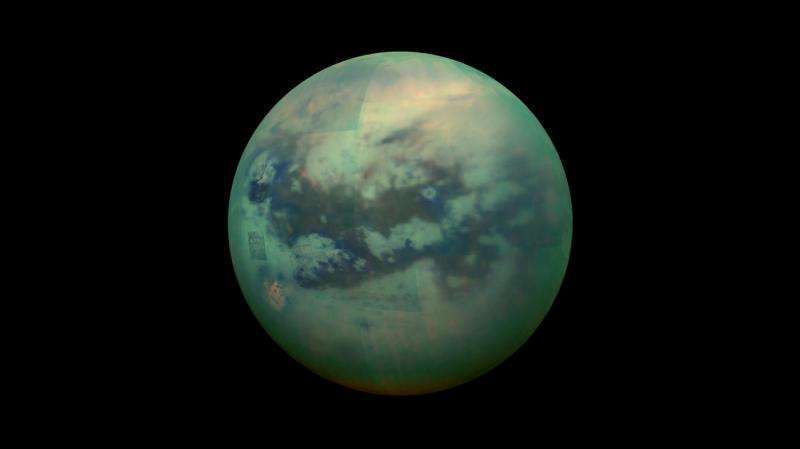 However, Titan's ocean is actually much thicker (over 100 kilometers thick), so its real dissipated energy, due to the changing distance between the moon and the planet, is expected to be much less. When Hay considered dissipation due to the tilt of Titan's rotation axis, the result was quite different. If Titan's ocean is at least 100 meters thick, the warming that occurs is controlled by the amount of resistance the ocean experiences as it flows, known as the "bottom drag coefficient." "This would mean the ocean is dissipating more energy than we expected otherwise," he said. "Of course, this relies on the magnitude of the bottom drag coefficient, which I emphasize, we don't know," he said. 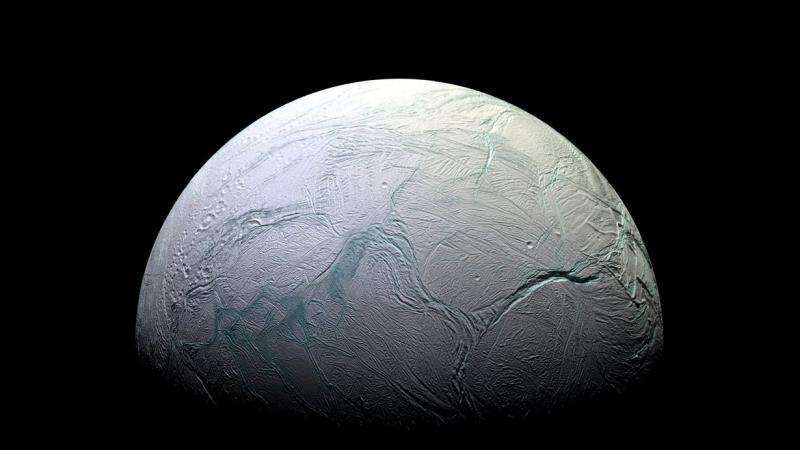 On Enceladus, according to Hay's modeling, warming from bottom drag and the changing moon-planet distance occurs most readily when the ocean is less than one kilometer thick, much thinner than the actual supposed thickness of the moon's ocean. The effects of Rayleigh drag show no significant amount of dissipated tidal energy. Unlike Titan, the rotational tilt of Enceladus is likely too small to cause significant tidal dissipation, so any energy for Enceladus would have to come from another process. Tides are known to have an effect on the satellites' orbits as well. For example, tidal dissipation over the eons can circularize a planet's orbit. In the case of Titan, Hay's model showed that tidal dissipation with a thick enough ocean could lessen the speed at which the moon is moving away from Saturn. A very thin ocean might make the moon migrate towards Saturn, but that's not expected to be the case on Titan. Hay said it's too early to talk in detail about any implications for astrobiology, but hopes that his research will lead to a better understanding of the tidal environment on Enceladus and Titan and how much tidal energy could be available to life on those moons. Cassini's mission will end in September 2017 when the spacecraft, low on fuel, is directed into Saturn. 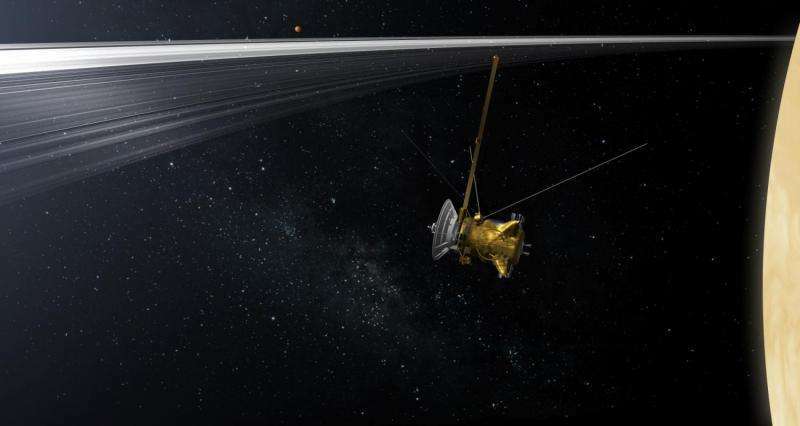 The maneuver will not only give scientists some measurements of Saturn's atmosphere, but will also protect the icy moons nearby from any chance of contamination. How, then, could energy be generated on a distant moon, far from the Sun's warmth? By photon blue shifting within the relatively mass dense core.